The NUHW immediately called for a re-run of the election, challenging voting irregularities. The two unions have traded accusations since. But now, Carlos Martinez, an immigrant from El Salvador who was on the SEIU's staff during the campaign, has come forward—so he says—to blow the whistle on his employer. Mr. Martinez went door-to-door canvassing the home-care workers during the 15-day election. Like him, many of them are native Spanish speakers; some are illiterate. Speaking in an interview over a sandwich at a hotel in the Bay Area late last month, Mr. Martinez says he was instructed by superiors to tell the workers that if they voted against the SEIU, they could lose their medical benefits, see their green cards or citizenship revoked and possibly be deported. He says he and other staffers were also told to pressure voters to spoil ballots that had been filled out for the NUHW. In other instances he filled ballots out for them. He says he even took some to the post office, as did other SEIU campaign workers. All of these actions, if true, are a violation of state or federal laws governing union elections. In all, he adds, he visited 550 homes. "We scared people. We took the secret ballot away from these people," he says. "It was wrong." Mr. Martinez says he raised his concerns directly with Mr. Regan and other superiors. He also says he tried to submit a complaint with two state agencies but was ignored. He then repeated these charges under oath before an NUHW lawyer. Six other Fresno workers confirmed parts of his account in affidavits. For example, Adriana Gomez, a home-care worker, said that Mr. Martinez "took my ballot and made a mark for the SEIU team." The NUHW last week filed a complaint with the Public Employment Relations Board, which has oversight over the workers in Fresno. The filing has been shared with the SEIU, but not released publicly. Describing himself as a medical case manager who is now in graduate school, Mr. Martinez, who says he fears for his safety, says he has gotten no money or other benefits from the NUHW. I had been wondering why Brave Sir Regan has been so quiet of late. It's his mug that has been pasted all over the Fresno IHSS election fight, and if this turns out as stated in this article, then it is going to be Brave Sir Regan who will have to answer for this. 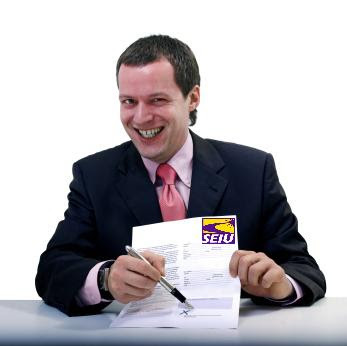 In any event, one has to wonder why SEIU always feels it necessary to lie, to cheat, to steal, to threaten, and to be otherwise generally unpleasant. They keep showing themselves as an organization that no one in their right mind would want to be part of. SEIU's tactics of intimidation and lies have been exposed so often that it should not surprize anyone who hears about them. But it is especially disgusting to learn that Regan went so low in Fresno that he was the architect of the plan to threaten Spanish speaking homecare workers with deportation by turning them over to the immigration authorities if these workers did not vote for SEIU. I commend Mr. Martinez and others for exposing these anti-union tactics by Regan and his Purple cohorts against homecare workers in Fresno and the entire state of California. If these charges stick, I wonder how the Zombies will defend their actions and if a do-over of the election will happen or if they will just give up, (as they have done before) and leave the Fresno homecare workers regain the wage losses UHW agreed to. and NUHW organizers are telling religious SEIU members they're going to hell for voting SEIU.